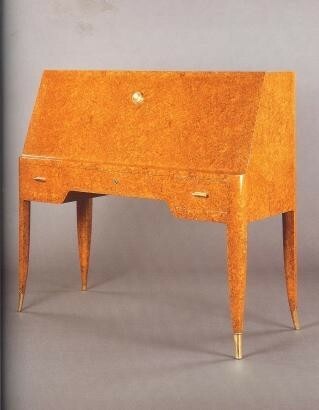 This is a rare and precious writing desk veneered in Burr Amber Amboina. It is supported by angle legs which get thinner down to the high 'duck's beak' gilt bronze ferrules. The keyhole with revolving cache and handles with rolled finials are also gilt bronze. The interior is just as impressive with morocco leather, lamps, storage compartments and drawers of red tinted Oak.